Caustic Burno wrote: As my old uncle used to say “ if you want your cows to stay home feed em”. Man here you better call the sheriff. Texas has some strange estray laws. Fifty cent pony end up being a show horse costing you thousands. Been there done that when I was selling bulls. 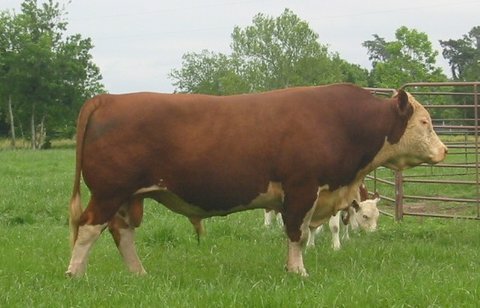 The sire of this boy ended up being hamburger because of that. Fence, hot wire didn’t mean anything. Second time he grew wheels to the salebarn. No actually these fence and range laws go back to the 1800’s. They have common law in the state along with county laws. It is as screwed up as a football bat. Selling one here is theft. I posted this before it’s an entertaining and educational read. Just because stray livestock are on one’s land does not mean the landowner can automatically claim them or remove them by other methods. Disposing of estrays outside of the procedure in Chapter 142 may be considered livestock theft. is taken up and shall cause the clerk to examine the State Brand Book. or her having taken up the animal, giving an exact description thereof. or her trouble. The trouble is no brand, only generic tags, on one, the other not even a tag. Arkansas. My frontage is all high tensile woven wire. Gate is a 20 foot BULL gate. Always chained and locked! That’s the way to have it. This was just a rented pasture 15 miles from home. About as sad of a fence as you can imagine. I ran a single Hotwire along the whole interior to keep mine in. The back of my farm is located on a blacktop county road where subdividing has brought in a lot of trailers on three to ten acre lots and some mansions on the 50 acre and larger tracts. Back there I have some fenced fields I maintain and one large unfenced hayfield with a barn. Fences on these other people's tracts has not been maintained for many years. An absentee owner turned out some horses on a small tract that is now a grassless sea of mud. They get out constantly and graze yards and my hayfield. Someone turned them into one of my fenced tracts. I turned them back out and called the sheriff. The sheriff contacted the owner and helped them get them back in. (calling the sheriff for stray dogs or horses is useless for they are more concerned with animal rights than farmer rights). Well, the horses are out in the road and in my hayfield again, they are losing condition and would starve without my grass. Neighbors are not what they used to be. Logan52 wrote: The back of my farm is located on a blacktop county road where subdividing has brought in a lot of trailers on three to ten acre lots and some mansions on the 50 acre and larger tracts. Back there I have some fenced fields I maintain and one large unfenced hayfield with a barn. Fences on these other people's tracts has not been maintained for many years. Very common issue. You are in central Kentucky, then you know how bad these amateur horse people are. They buy a place in the country, put six horses on a half acre and think that is all there is to it. They only come out to their property from Lexington or Cincinnati on the weekend. Weekend farmers. They never invest in fences, they never invest in improving the forage, and they think a half acre of pasture is enough for 6 horses for ever and ever, no inputs. Some don't even keep them watered. It's awful. Your only solution is to call the Sheriff or County Judge Executive. Both are elected offices so they want you happy. But the only sure resolution, is the best fence you can buy. Wait until you get to deal with stray Bison. Some of us don't realize how well off we are.I have National Forest in front and behind me on the mountains and only join three other neighbors. In two instances,we have joint fences and we both look after the fence as neither wants their cattle out.In the third,there is a state road and a river between us and both of us keep fence on our sides. I always try to be real understanding if one of the neighbors has cattle get on me.Next time it may be mine who get out. None of us brand but we all use different color ear tags so finding owners is not a problem.All of us try to get along with each other and that is great,too. Every fall when we gather for shipping and preg testing we sort off some neighbour cattle, and the neighbours do the same for us. We always take a trailer when we go to help with the sorting and testing. Or lend a hand and help fix her fence.